A system is often defined in terms of the poles and zeros of its transfer function. You will see later that the location of the poles and zeros gives a wealth of information about the behavior of a system. This document is only concerned with the creation of a pole-zero representation, and not its interpretation. Rewrite this in a standard form such that the highest order term of the numerator and denominator are unity (the reason for this is explained below). This is just a constant term (b0/a0) multiplied by a ratio of polynomials which can be factored. In this equation the constant k=b0/a0. The zi terms are the zeros of the transfer function; as s→zi the numerator polynomial goes to zero, so the transfer function also goes to zero. The pi terms are the poles of the transfer function; as s→pi the denominator polynomial is zero, so the transfer function goes to infinity. The pole-zero representation consists of the poles (pi), the zeros (zi) and the gain term (k). Note: now the step of pulling out the constant term becomes obvious. With the constant term out of the polynomials they can be written as a product of simple terms of the form (s-zi). This would not be possible if the highest order term of the polynomials was not equal to one. Often the gain term is not given as part of the representation. The nature of the behavior of the system is given by the poles and zeros (e.g., does it oscillate? decay quickly? ...), the gain term only determines the magnitude of the response. In many cases a plot is made of the s-plane that shows the locations of the poles and zeros, and the gain term (k) is not shown. See the example below. First rewrite in our standard form (note: the polynomials were factored with a computer). polese at s=-1+j, s=-1-j and s=-3. Often the response is given in terms of a pole-zero plot. The plot below shows the poles (marked as "x") and the zeros (marked as "o") of the response. The gain, k, is not shown. 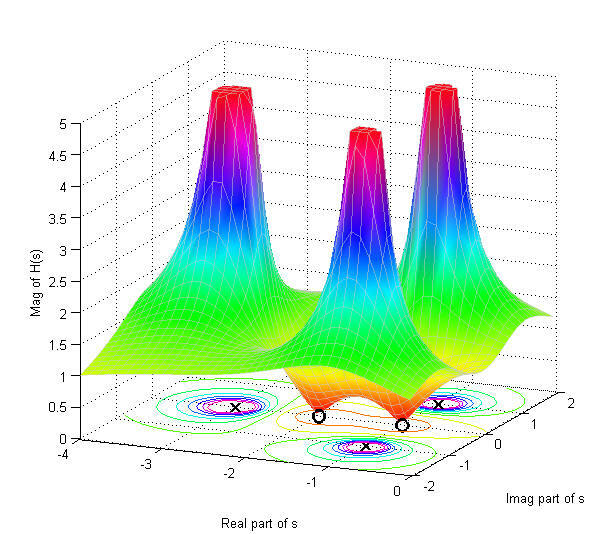 To demonstrate why these are called poles and zeros, the plot below shows the magnitude of H(s) as s is varied. Note that it goes to zero at s=-1 and s=-2; these are the zeros of the function. Also, it goes to infinity at s=-1±1 and s=-3, but is clipped at |H(s)|=5 in the drawing; these are the poles of the function. It is as if there is a "pole" holding the surface of the function up at those locations. The locations of the poles and zeros are shown on the s plane for reference. Often the gain term is not given as part of the representation. System behavior is determined by the poles and zeros (e.g., does it oscillate? decay quickly? ...), the gain term only determines the magnitude of the response.